I have been experimenting with custom-built chassis for 1/32nd scale cars. Not with a lot of success mind you -- but I'm working on it. One feature that I have integrated into several of these chassis has been borrowed from recent developments in HO scale gravity cars. That is, designing the chassis to flex in the "roll" direction (as opposed to "yaw" and "pitch") so it can keep all four wheels on a track that includes banking. The front and rear axles do not have to stay in the same plane. The last two chassis I have built are set up with a pivot just forward of the motor. That keeps the front axle and guide shoe rigidly aligned, so the guide shoe stays square versus the slot, while the rear of the chassis is free to rotate and keep both rear wheels in contact with the track, even if the track is twisted for banking. Designing flex into a chassis is not new, but I have not been aware of chassis designed with an actual pivot in the middle. The difference is that a flex chassis has a spring action that tends to resist twisting, while a pivot has no resistance to twisting. To date I have not bothered to install stops on the pivot. It is free to spin 360 degrees, limited only by the body's wheel well clearance. So far that has not seemed to be an issue. The handling of these cars has been good enough that I am continuing to include pivots in my development chassis. It seems to be a worthwhile feature. That is not a surprise, since the gravity HO slotcars with built-in flex perform markedly better on tracks with banked curves. I'll post some photos of my pivoted chassis soon, once I puzzle out how to post photos so they won't evaporate if SCI hiccups. Hello Ed, Central pivot chassis have been around since likely the early 70's and are generally known as "Flexi Boards"..........they have a centrally located hinge that allows rotation on the "roll" plane. This allows the chassis to "twist" allowing the rear tires to maintain track contact without having the inside rear tire lift in corners. This is particularly important for the type of tyres commonly used these days in the 1/32 world (rubber/silicone/urethane), as these tires are relatively hard (compared to sponge) and as they generally don't compress much, the car tends to be forced to lift its inside rear. Critically, if the "twist" is controlled by some form of torsion bar, the rear tires will load more progressively and improve grip/traction. You will need to experiment with the amount of flex needed...........generally, tighter tracks/slower motors/less grippy tires will favour a softer flexing car, while faster tracks/stronger motors/grippier tires will require a stiffer flexing chassis. As a general rule, if the car chatters in corners, the flex is too soft. Uh, wow Chris... You are obviously a master fabricator! And your designs are fascinating. Lots to puzzle through here. My pivot designs are much more crude, though they are perfectly functional. One thing you mention -- that a full-scale car's suspension includes both springs and shocks. Certainly true, but I don't see any shock absorption mechanism in your designs other than the friction in the pivot itself. Which probably isn't much. The piano wire components certainly act as springs, but not so much as shocks. Two ways I see to create shocks. One is to have something off the centerline of the pivot that rubs one half of the chassis against the other. A purely mechanical shock not all that different from some on early automobiles. 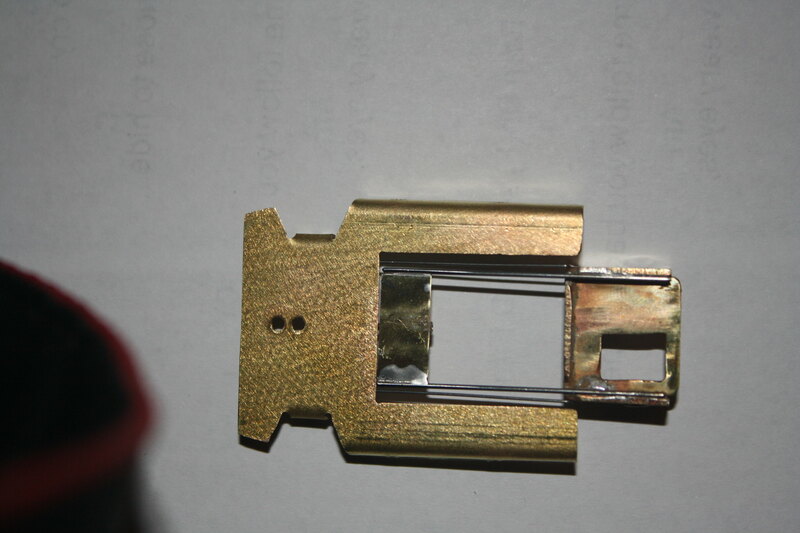 Some kind of spring will be necessary to create the rubbing force, and that can be tweaked to adjust the damping force. The other, which I consider so wonky as to be almost irresistible, is to create an eddy-current damper. It requires a very strong magnet, again, off the centerline of the pivot, that doesn't quite touch an electrically conductive plate -- typically copper. As the pivot rotates that magnet wipes past the copper plate -- without actually touching -- and induces "eddy currents" in the plate. Those eddy currents take energy to create, which comes from the force that is causing the pivot to rotate. And that energy is quickly lost to heat in the copper plate. So that setup absorbs energy and dissipates it, which is exactly what a shock absorber is supposed to do. A couple nice things about the eddy current shock absorber. 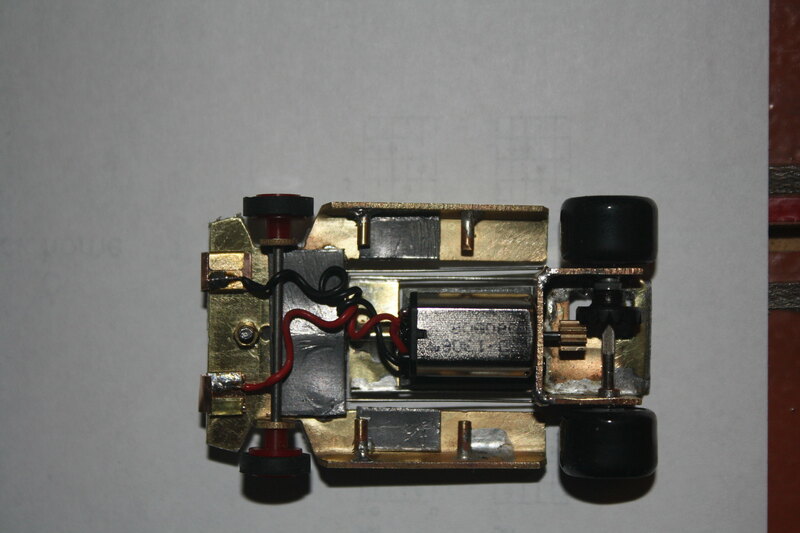 With modern magnets it can be made small enough to fit in a slotcar, and it also can be tuned. The strength of the magnet is one tuning factor. Another is the clearance between the magnet and the copper plate. If you have a way to adjust the clearance you can fine-tune the shock absorption rate. You also have the opportunity to adjust how far off the centerline the magnet sits. Farther away gives you more torque, and more damping. And an eddy current shock absorber has no "sticktion". Since the magnet does not actually touch the copper plate, there is no "break-away" torque needed to start the pivot rotating. That should help the chassis respond quickly to changing loads. Like I said, beautifully wonky. Almost too good not to give it a try. PS - I see an opportunity to create both a spring and damper if the plate is steel instead of copper. Last edited by HO RacePro; 03-24-2019, 10:50 AM. Following along with great interest per usual. As a longtime early 911 enthusiast, Im no stranger to adjustable progressive torsional dampening on all four corners. Certainly overkill on a slotcar chassis, but severing unnecessary communication between the front and rear axle in a straight axle arrangement would appear to have great merit in a large scale slot car application. A little wiggle room in the right places is what gives a scratchbuilt platform that special feel that makes you not want to stop driving it ... grins. I'll toss out something that popped into mind. Consider the cost saving transverse composite leaf spring used in some Corvette IRS arrangements, verses exorbitant coil overs. Now relocate the concept in the middle of the center pivot chassis. My suspicion is that a PTEG, perhaps Poly, or the like could be fashioned into simple torsion leaf or plate arrangement. Ideally, on the initial fishing expedition one would allow for some tailoring/experimentation with respect to using multiple leafs or thicker materials, so you dont paint yourself into a corner on the prototype. As I scribble this out on the soggy cocktail napkin in my mind, the leaf would be affixed to the front end of the rear half of the chassis, and overlap to the rear of the front end, BUT remain unfixed. One would have to allow for some fine adjustment. Im thinking of a simple bendable perch/tab where the ends of the leaf contacts the front half of the chassis, so you can crank a little pre-load into the set-up. If the static pre-load is excessive, one can always shim the leafs mounting point. Sight unseen at this point, it is not to say that one side or the other of the springing arrangement might not have to be pared back, perhaps using a triangular shaped torsion plate rather than a fully transverse unit. Consider that a partial stiffener might be required if the dampening is overly light. It's not so much shape, rather the behavior of the material that interests me. Its free, its slippery, very tough, and easy enough to work with. Thanx alot guys! grrrrrr ...,. LOL Now Im going to have to consider fiddling this down to my chosen demented mice scale. Last edited by model murdering; 03-25-2019, 01:20 PM. Boy it would help to have a sketch! But if I've puzzled out your proposal correctly, you are looking to use a leaf spring suspension that connects the front half of the chassis to the rear. And I get the impression you are looking to 3D print the leaf elements. By "PTEG" are you perhaps referring to PETG (Polyethylene Terephthalate Glycol)? I have an idea how you could make your spring rate easily adjustable. What you need is a pair of sliding clamps for the leaves. Move the clamps outboard to increase the spring rate, inboard to decrease same. That should give you the opportunity for quick and fine adjustment. You just need to make sure the clamps don't migrate under racing loads. There is room for argument whether it is better to have free rotation of the chassis halves relative to each other, or springs, or dampers, or both. It is important to remember that the physics of chassis design do not scale directly. It's the same business that allows a slotcar to crash into a wall at gigantic scale speeds and emerge unharmed, while in full scale such an event would compact a car into a cube. A beautiful example of this is how loosening up the screws that mount the body on a slotcar improves its handling. Try that trick on a full-scale car and observe the result. Given that chassis physics does NOT scale, the only practical way to untangle this is by experiment. That is, on the racetrack. A couple of more examples of "flexiboard" (central pivot hinge ) chassis,....these a little more complicated, using fine EDM cuts into the chassis plate to provide the amount of torsional flex required, depending on the track/tire/motors used. Whether simple examples (like the builds in my previous post) or more complicated ones, the hinge rotation must be controlled/under tension to.....1/ Allow the outside tire to load progressively, which improves bite/traction,..and 2/ to provide a consistent and predictable handling characteristics........uncontrolled pivot rotation will not provide this. Virtually all, actually ALL, competitive scratchbuilt chassis incorporate some form of "controlled" torsional rotation.......and in the world of plastic chassis, the quicker guys have adopted the practice of "taping" their loose chassis pods to achieve the same effect......... a measure of torsional "flex", as opposed to torsional "flop". The attached chassis are far from unique, with every competitive chassis following the controlled flex design, most utilizing a central pivot as the base. WoW - very exciting topic! chrisguyw - the picture of the last chassis looks extremely fragile - what metal are they made from? and who's laser cutting them!? also, what kind of body goes on that? The complexity of those laser-cut chassis is stunning! Are those 1/24th scale chassis? Forgive me, but my first reaction to such complex chassis is, "Uh, really!?!" I have a hard time accepting that all that "stuff" is actually beneficial. Which is not to invalidate your point, that a spring rate in a flexi chassis is essential. I do accept that performance on the track validates or invalidates all theory. Spinning theories is fun, but proof comes from the winner's circle. And it appears you speak from experience. That argument about progressive loading of the outside rear tire makes some sense if you regard said tire as having a spring rate. You don't want it to bounce! But again, that is more about shock absorption than flex. I am still trying to puzzle out where the shock absorption comes from. Maybe it is all in the tires themselves. Sponge tires with a bit of memory should absorb significant energy when they compress under load. That may be the whole game right there. Yeah, I'm still trying to make theory catch up with practice. A valid theory is a powerful thing! It is an invaluable tool towards developing winning technology. Too bad invalid theories are so easy to formulate and are so prevalent. They waste a ton of money, time and effort. In case it isn't obvious, my pet theory is that shock absorption is critical to slot car handling, but what works as a shock absorber in HO or 1/32nd scale isn't anything like what works at 1 to 1 scale. That "physics doesn't scale directly" thing. I'm not giving up on that theory yet. I've seen it work too well. Ed, this is my HO center-hinged chassis. Unfortunately, the fabrication is no where near as clean and eloquent as Chris', but it is very functional. Note that it has two spring elements. The inner pair of spring elements offer flex in the pitch axis. This affects/aids forward bite. 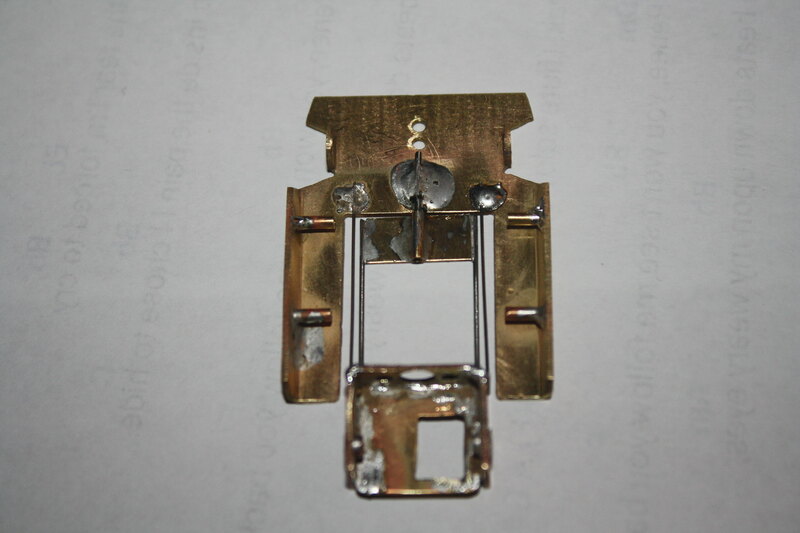 The two outer spring elements control the roll axis of the chassis. Notice that these elements do not attach at one end through a slip fitting but are bent at 90 degrees at the rear and attach to the top of the motor/axle carrier box. This allows the chassis to roll, and with the bends in the spring elements, presents a push/pull force that sort of acts like an anti-roll bar. The completed chassis shown was built for the high speed banked ovals upon which HOCOC races and is geared very aggressively at 8/15. The road course version of this chassis features different weight distribution, omits the lead weight from the motor pod, and is geared at a conservative 7/24. You've seen what the oval racing version of this chassis can do. The road course version performs very well on the Parma track at LenJet Raceway. The Parma track is a wonderful mix of high speed banked turns as well as slower flat turns. The motor box/rear axle carrier and the front/side pans are modified Landshark items as supplied by Al Thurman. Another thing Chris mentions, tape under the chassis, this really helps dampen movement. Springs don't dampen movement, they store Potential Energy. R/C cars use oil filled dampers with pistons of various diameters and hole sizes, they have springs outside them. These are scaled down dampers just like full sized cars. When you get down to 1/24 and 1/32 it's not really feasible to have a mechanical damper so we try alternatives. 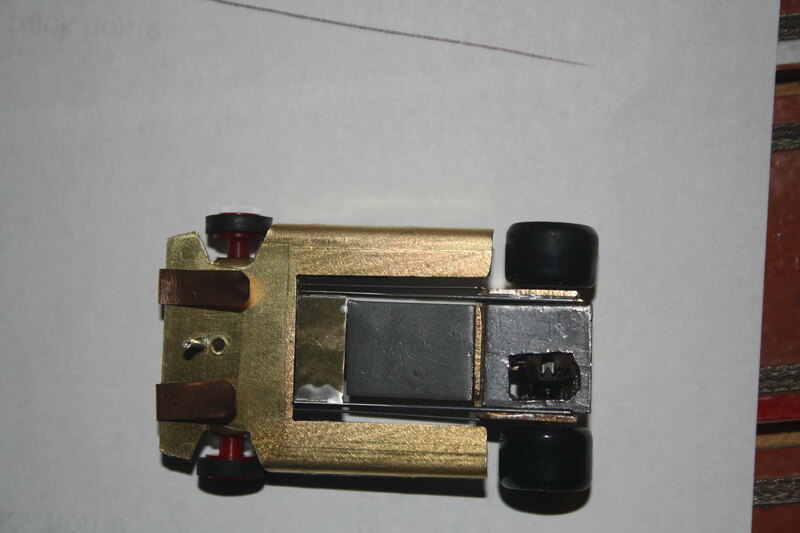 The spring we already see but for damping the simplest form we can use in a slot car is - tape. Try it in various places across or along the motor pod, different widths, one or more thicknesses. The chassis' in my last post are all 1/24, as I had handy pictures,........the 1/32 Laser cut variations look the same/incorporate the same design principles, and gmcullans' excellent HO chassis, while using brass/piano wire (as the cars in my first post) also is a "flexiboard" design......nice job by the way gmcullan ! !..........so...........the controlled torsional flex dynamic is not scale specific, its ability to provide a rudimentary form of rear axle roll control (basic shock absorbtion ) aids all the various sizes of our toy cars.....while the outright forces (as speed differs), are somewhat different across the various scales, the situations they face on track are the same.....and,....the better handling cars will more effectively place and control their rear tires on the track. As far as "track results", gmculann appears to be very pleased with the handling of his chassis, .....the 4 brass/wire cars in my first post all won their respective North American/European proxy series (all had spec motors,..so they were largely "handling" proxies), ALL cars running in the worldwide IMCA/ISRA /BSCRA /D3 etc. etc. series events utilize controlled torsional flex, and as previously mentioned virtually every winning car in the 1/32 plastic scale clubs/proxies utilizes a variation of controlled torsional flex...........more or less unanimous results. While 1/32 cars with some "free" rear axle torsional movement were popular in the US and European club scene in the late 60's early 70's, "controlled" movement took over in the early/mid 70's, and it has remained that way since. As far as tire "compression",......all the tires used in current slot racing have some amount of compression.......with the rubber/silicone/urethane (what most folks on this forum run on) having significantly less than the sponge tires........therefore as most 1/32 racers are on these "hard" tires, which are far more likely to bounce, controlling the rear tire position, and giving them some added help in shock absorbtion is extremely beneficail (moreso than with sponge tire cars)............a "flexiboard" design, with the correct level of rear axle rotation control (by altering the length/dia. 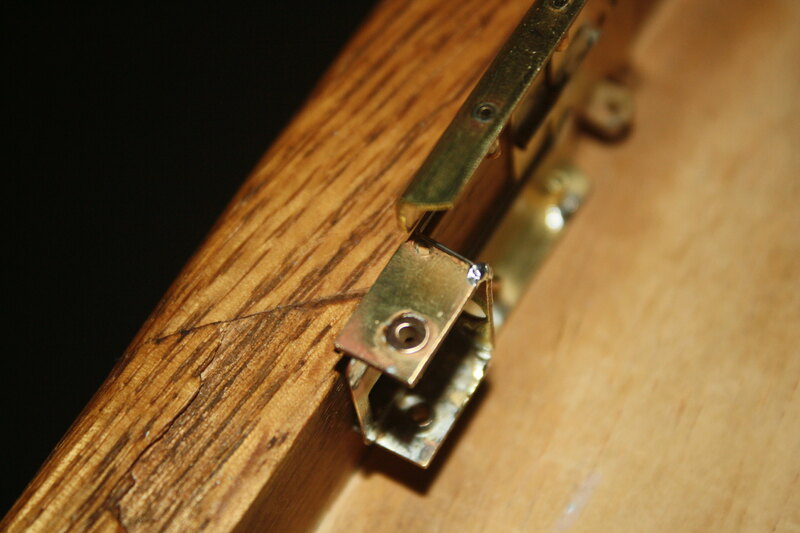 of the piano wire torsion bars) goes a long way in addressing this problem. I likely have missed an answer here or there....please let me know. As shown above, the Euro chassis have a fair amount of torsional twist designed into them. Some more than others. I've got a five of this type of chassised car. I also built a center pivot chassis a few years back similar to this one. But I didn't add a stiff "shock absorber" like the rest of Chris's chassis. I used an .03" wire but way away from the center on both sides of the chassis so it was pretty flexible. The "shock" wires were only soldered on one end. so that they could rotate freely also. I ended up selling it to a fellow racer at the time. I started another one similar, haven't finished it yet. Last edited by Mike-; 03-27-2019, 06:19 PM.